Today we bring you the history of a workhorse coin. For 54 years, this small-but-mighty coin was an essential component in the engine of American commerce. Countless millions saw this design every day for over half a century, and for many, it represented a honest hour’s work. While this coin doesn’t get the attention of, say a $20 St. Gaudens, it represents a breakthrough in both design and technology. The Seated Liberty Dime was minted 1837-1891, starting at the end of Andrew Jackson’s presidency. Jackson’s presidency inaugurated what would come to be known as the “Jacksonian era” in American politics. The era saw an expansion of suffrage to non-landowning white men, and increased public participation in government—seen, for example, in the election (rather than appointment) of judges. At the same time, the country was rapidly expanding through war and settlement. Many Americans believed in Manifest Destiny, the idea that America was destined to stretch from Pacific to Atlantic, with settlers paving the way. The idea of the wild, dangerous frontier and its place in the American character grew in prominence. The era, in other words, was one of expansion, populism, and national myth-making. 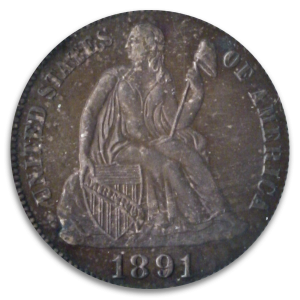 In the midst of all this, in 1837, America became ready for a new, bolder coinage. Mint Director Robert Maskell Patterson requested an image of the goddess Liberty inspired by the Britannia of English coinage. The resulting design was immediately praised for its artistic qualities and symbolism. Liberty, in a flowing dress, sits on a rock while holding a Liberty pole in her left hand. The Liberty pole originated in ancient Rome as a symbol of the people’s freedom from Caesar’s tyrannical rule, and liberty poles were frequently erected in colonial town squares before and during the American Revolution. Liberty’s right hand rests on a Union shield inscribed with the word LIBERTY. The reverse features the words ONE DIME surrounded by a wreath of not just the traditional laurel leaves, but the American symbols of corn, wheat, and maple leaves as well. While the design represented a shift in American coinage, so too did the coin’s manufacture. The Mint had long aimed to create coins resistant to counterfeit, and made a major leap forward with the Seated Liberty coinage. The reverse was manufactured 100% by machine—without any elements needing to be added by hand. By increasing uniformity among coins, this technological breakthrough discouraged counterfeiting. For all its positives, the Seated Liberty Dime did run into some trouble in the court of public opinion. Namely, why didn’t it have the usual 13 stars for the first 13 colonies? One year later, stars were duly added, and the rest of the design was adjusted to make room for them. Quite a few other major and minor design changes were made over the coin’s 50-year history, creating numerous opportunities for collectors. One particularly unusual variant is the 1859 transitional design, which lacks reference to the coin’s issuing nation!